We can answer a simple question to our office right now! Who needs training and also how often? General staff – Fire safety training should include the content of their fire emergency plan, fire extinguishers, what to do if they discover a fire and also what to do when the fire alarm operates. They should also carry out regular fire drills. Fire marshals and fire wardens. Persons appointed as fire marshals and fire wardens need to know all of the above and also how to perform their role. This will depend whether a workplace uses a roll call, sweep method or a variation of both evacuation methods. Therefore fire marshals and fire wardens should have additional fire training. They could attend on of our fire marshal courses or have in house fire safety training. The person nominated to call the fire service. This person needs to know how to call the fire service and when thy should do it. They should understand the unwanted fire signal policy that many fire services operate so that the fire service are not called to false alarms. Evacuation buddies. These persons will help evacuate disabled persons when a fire alarm operates. Therefore they must have additional and regular fire safety training. Other persons. Some persons have simple tasks to perform when a fire alarm operates. This could include shutting off machinery or kitchen equipment. Other persons may also have other simple tasks to assist with a safe evacuation. All these persons need extra training. This will depend on the level of risk in a workplace. High risk workplaces should have frequent fire safety training. Low risk buildings can have training less often. 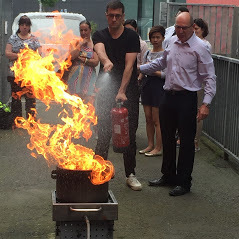 Fire safety training – what we offer! We provide open fire marshal and fire extinguishers courses. Our team can also provide in house fire safety training that includes training for marshals, wardens, persons calling the fire service and also general staff. Either call or email us for more details.